Ever wonder exactly where your arch is? Given your particular facial structure/shape, there is a specific spot where your where your eyebrows should start, end, andarch. The trick is not only simple but requires practically nothing – just a straight edge of some sort (pencil, end of a makeup brush, even a ruler!). Use your straightedged tool and align it to the bottom tip of your nose. Straight up from this point is where your brows should start. Use your straightedged tool and place it on the tip of your nose. Angle it directly across the center of your pupil. 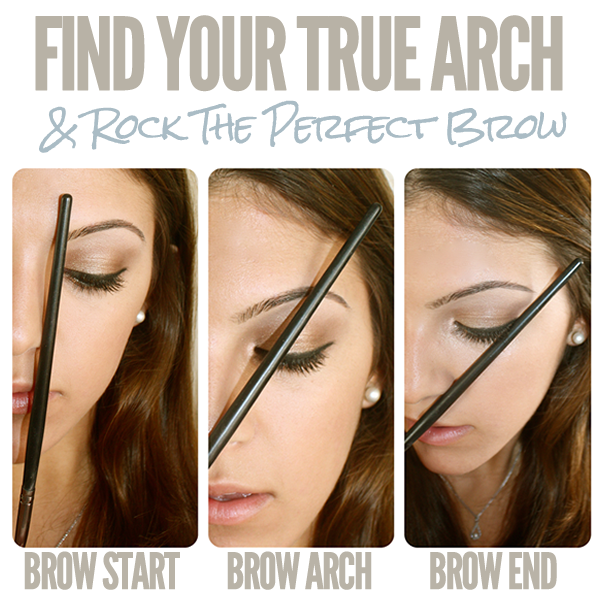 The place where the straightedged tool meets your brow is the ideal spot for your brow to arch. Use your straightedged tool and again align it with the bottom of your nose. This time, angle the straightedged tool in the direction of the outer corner of your eye. Where this angle meets your brow is the ideal spot for your brow to end. As you can see above, my brow is not “ideally” long enough based on the technique, so I should aim to grow it slightly longer. Before you run to the salon to get your brows done, try this technique. Still can’t find your arch? Try letting your eyebrows grow in naturally – full length, width, and all! This will help you find your most accurate and natural arch.